If you like to have lunch with Harley Quinn then now you can if you eat from this Harley Quinn lunch box. 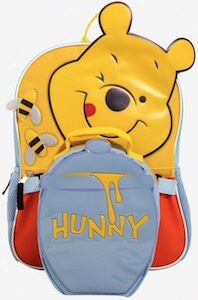 The lunch box is fun for back to school or taking for to the office. 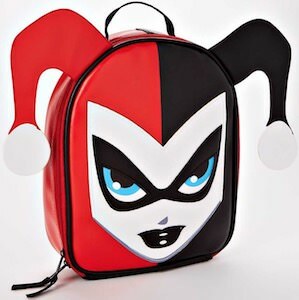 As you can see the lunch box look like the head of Harley Quinn as the classic jester on the top of the lunch box it has a carry handle and there are those big jester hat pieces sticking out on the side. Now you can take you lunch without the need of a paper bag all thanks to this fun looking Harley Quinn lunch box. If you like Animal from the Muppets and you are hungry then you have to check out this Animal lunch box. 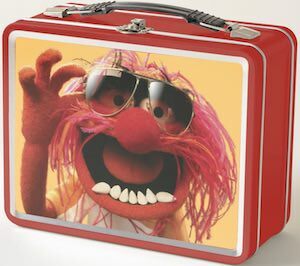 The metal Muppet lunch box is red but also comes in different colors and has a sturdy plastic carry handle and shows fun picture of Animal and he is wearing sunglasses. 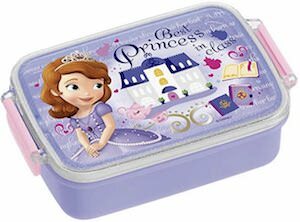 A fun metal box like this is great for taking your food to school or work but you could also use it as a handy storage box that can hold all kind of things like toys, papers or what ever and is easy to take thanks to the handle. If you like Riverdale and need a new lunch box for back to school then you have to check out this Pop’s Chock’lit Shoppe lunch bag. 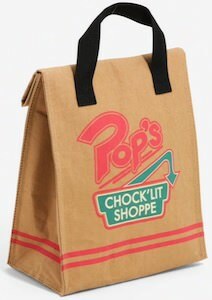 Riverdale fans all know about the Pop’s Chock’lit Shoppe diner and by that will know how cool this lunch bag is as it has the logo of the diner on it. The lunch box looks a lot like a to go bag from Pop’s Chock’lit Shoppe and even looks like a brown paper bag and all that makes it really cool. The Riverdale lunch bag is insulated to keep your food at the right temperature for a while and the easy carry handle makes it perfect for taking to the lunch room or maybe a picnic bench outside. If you like The Incredibles then you are in luck because now there is a nice The Incredibles II lunch box. 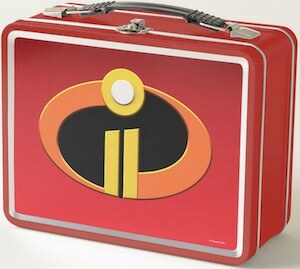 The metal lunch box is red (also comes in different colors) and shows on both the from and the back the famous Incredibles logo but look a little bit closer and you will see that it is actually the Incredibles II logo. It is a great metal lunch box with a handle on top for easy carrying to the lunch room. And a cool box like this is great for other things then food to and can be just a nice decorative piece too. If you want to take you lunch to home and school and just need to perfect lunch box then you just have to check out this black panther lunch box. 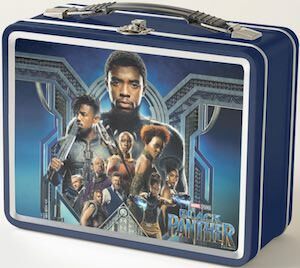 It is a nice metal lunch box with on the front and back a picture that includes a lot of the movies cast with the Black Panther on top and even the movie logo can be found on the side of all the people. As you can see on the picture the metal lunch box is blue on the sides but you can pick the color as it is available in 6 colors. 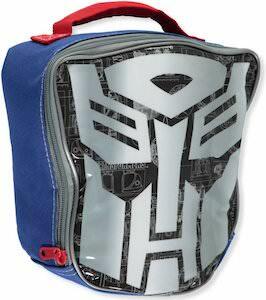 So now you can have the perfect lunch box for back to school or to store you Black Panther collectibles in. 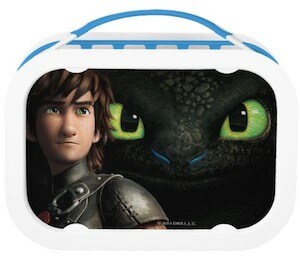 If you really like food and How To Train Your Dragon then you just need this Hiccup & Toothless lunch box. The lunch box is made by Yubo and comes with a sandwich box, two snack boxes and an icepack inside it so that you are all good to go. On the outside of the lunch box you find an amazing image of Toothless in the background making it black with the big green eyes and then in front of the dragon it shows Hiccup. 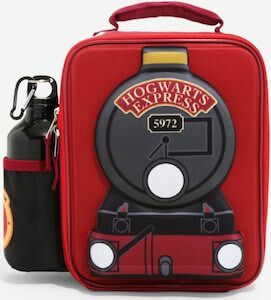 You can even choose the color of the sides of the lunch box so that it really looks the way you like.